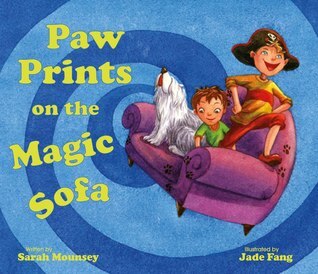 Paw Prints on the Magic Sofa: Great springboard for creative thinking – what if this sofa/carpet/chair could fly – where would you go – what would you do – who would you meet? This book is filled with repetitive refrains – my young grandson was reading along with me by the end of the book. 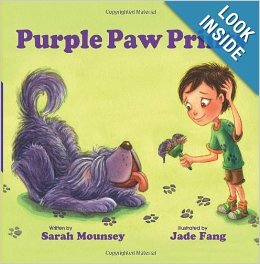 From Sarah’s Goodreads profile:”” I have always loved to write for children and I have had a lot of fun writing Purple Paw Prints and Paw Prints on the Magic Sofa. The Paw Prints books won a bronze medal in the Moonbeam Children’s Book Awards in the category for best picture book series. I am an Australian and I grew up in Brisbane, although it has not been my home for over a decade. After spending eight years in London I now live in Singapore with my husband and my three young sons. To find out more about Sarah, please visit her awesome blog. Here books just won the Moonbean Children’s Book Award. 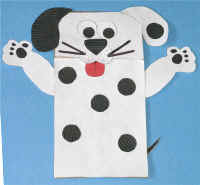 To extend the enjoyment and learning of every story time, I love to use a craft activity. In my SHOW ME HOW! book, you’ll find 100’s of quick and easy activities. Here’s a fun project using a paper bag. White or colored paper plates, brown or white paper lunch bags, a box of markers, a pair of scissors, a glue stick and some construction paper – that is all you need for hours of inexpensive, educational, self-esteem building fun with young kids! Here’s another idea: On pieces of paper, write the names of household items such as flashlight, frying pan, blanket, etc. For very young children, draw a picture of the item next to the word…this is a great way to teach sight word vocabulary! Fold each paper and place in a paper bag. To play the game, participants pick out one of the papers and try to think of how they would use that item…the more creative, the better. Score one point for each way…for example: a frying pan can be used to cook, to cover our head when it rains, as a template for drawing a round shape, for pressing out pie dough…that would give me four points. What else could you use a frying pan for? 1. Author Emily Lim tagged me in an author blog hop. I hope you will come back on Saturday. I’ll be posting my entry…can you guess which authors I am tagging? And there will be a giveaway as well! 2. Tara Lazar has opened registration for PiBoIdMo. If you know what that is, you’ve probably already signed up. If you don’t, PLEASE DON’T MISS THIS AMAZING OPPORTUNITY TO CONNECT/LEARN/ENJOY! 3. Julie Hedlund, founder of 12×12, is doing an awesome series on CROWDFUNDING A PICTURE BOOK – with YouTube videos and everything. Follow along and find out what that is all about from a true pioneer woman! 4. Tina Chen has a wonderful link up that is all about books and reading with children…she calls it BOOKNIFICENT THURSDAYS! 5. Dianne de las Casas is gearing up for another fabulous PICTURE IDEA MONTH…a month-long celebration of picture books with awesome daily posts by leading authors, illustrators and others in the kid lit arena…November sure is a special month! This entry was posted in Craft for kids, Perfect Picture Book Friday, Picture Book Review and tagged Booknificent with Tina Chen, Critical thinking, Crowdfunding with Julie Hedlund, How to develop problem solving, Jade Fang, Make a paper bag dog puppet, Moonbeam Children's Book Awards, Paw Prints on the Magic Sofa, PiBoIdMo with Tara Lazar, Picture Book Month with Dianne de las Casas, Purple Paw Prints, Sarah Mounsey, Singapore by viviankirkfield. Bookmark the permalink. Not only do I remember the commercials . . . I met one of the Double Mint twins this summer at a 90th birthday party for our next door neighbor. She and the neighbor formed a friendship about 20 years ago that still lingers. Thanks so much for sharing the story about the double-mint twin, Nancy…that is so cool! Glad you liked the books and the puppet! Cool! Cyb or Trish? I fell in love with them on a cult favorite TV show in the 70’s. They are still quite the classy gals. I can remember what her cool cats looked like because she showed me photos of them eating on the patio of her house in Sarasota, FL ~ they reminded me of jungle cats, only smaller. Hi Vivian! Another great review! We’ve been missing you over at Booknificent Thursdays! Here’s the link for this week’s if you have time – http://mommynificent.com/2013/10/24/booknificent-thursday-link-party-16/ – but please stop by whenever. You bring such a wonderful voice to our community. Thanks so much, Tina! Our 2000 mile move from Colorado to New Hampshire really put the brakes on most of my blogging and social media stuff…but I am slowly but surely getting back into the routine. I’ll head over to Booknificent Thursday right now! Sounds like there are lots of reasons to read this book, Vivian! And it’s always a privilege to meet the authors in person, isn’t it? You are so right, Jarm! 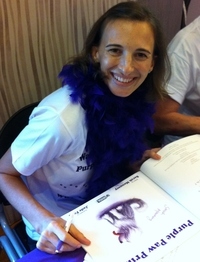 I was fortunate to connect with so many incredible authors and illustrators in Singapore at the 2013 AFCC in May. This is a well-crafted opening line. Pretty hard to resist. Thanks. The books look adorable! The artwork is super cute! My daughter would love them. The activities that you chose would be a great way to engage kids too! Hi Reshama…forgive the long delay in posting your comment…it fell into the spam folder. :( Thank you for stopping by…I’m so happy you like the books and crafts! These sound like fun books. Thanks for sharing! Oh! These books are right up my alley! Paw prints everywhere!! I will have to check these out. And I like your activities. That puppy puppet is great and the game sounds like lots of fun too. We’ll have to try it all! Thanks!! Looks like fun books to read! But I wouldn’t dare asking boys what else they could do with a frying pan. They highly imaginative and destructive tendencies could lead to disaster! Was it a kool-aid dye-job? Love the book concept. It sounds very visual and filled with humor. Reminds me of my poodle. Every time I let him out when it rains, he prances across my floor and carpet with tinted brown footprints — if I don’t catch him in time. Can only imagine what the kids try to do to clean up the mess. Both books sound like a lot fun! I love animal books and these sound adorable. Great choice, Vivian.